“Health is wealth.” Part of keeping your health in check is keeping a record of your blood pressure. By keeping an eye on your blood pressure levels, you will be able to determine whether or not it is normal and if you need to put in a little more effort in order to improve your numbers. 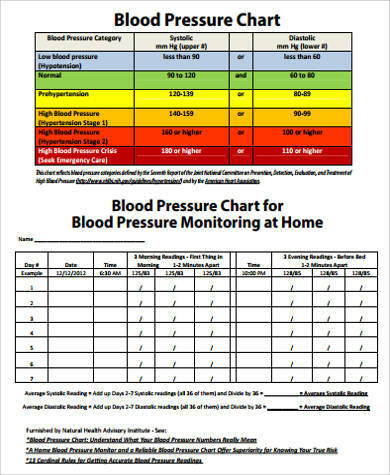 Having a blood pressure chart could help you monitor your health. 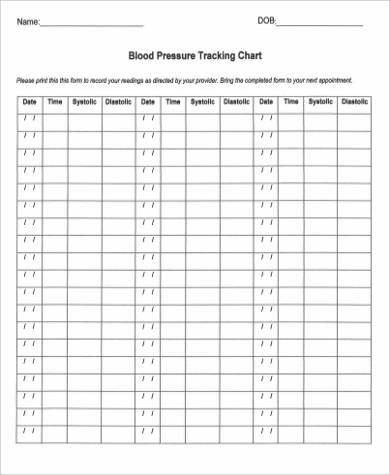 With the following templates, it will be easier to keep track your blood pressure. These nine chart templates are all available for download and printing. If you want your chart to be more colorful and personalized, you can also refer to Sample Color Charts. The normal blood pressure of an adult is different from the blood pressure of a child. Blood pressure may also fluctuate if you are pregnant. There are two numbers used to measure the blood pressure. 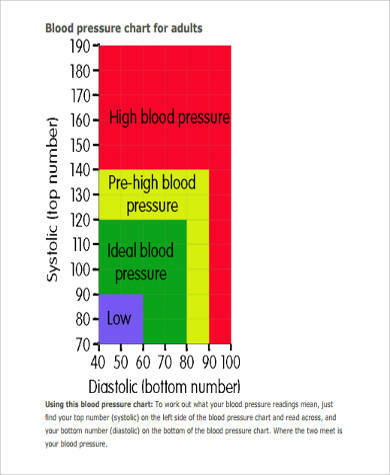 The systolic blood pressure or the upper number, and the diastolic blood pressure or the bottom number. The former measures the pressure your blood exerts when your heart is beating while the latter measures the pressure your blood exerts when it’s resting. 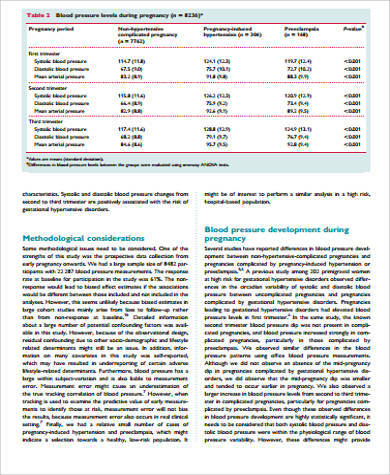 Blood pressure measurements vary according to age. 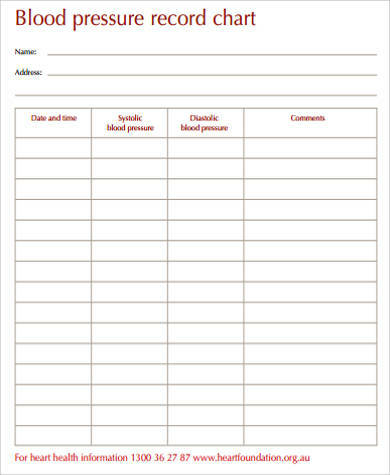 Keeping a journal or a record of your blood pressure is convenient and is recommended for people who are at risk of high blood pressure or hypertension. 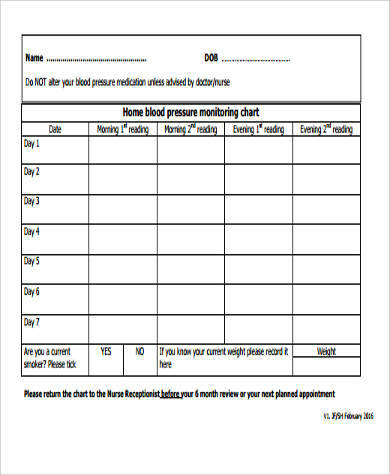 This is to help you monitor what are the actions that you need to take in order to normalize your blood pressure. Avoid doing extensive exercises 30 minutes before you measure your blood pressure. Avoid smoking and drinking caffeine. Sit properly. Correct posture will give a more accurate reading of blood pressure. Make sure your back is supported and your feet are flat on the floor. Your arm should be supported and relaxed. Make sure to measure your blood pressure at the same time every day. Do not panic if your reading is high. Relax and try again. Take multiple readings every time you measure your blood pressure at intervals of one to two minutes apart. Keeping your health in check is vital to avoid various trips to the doctor’s office. 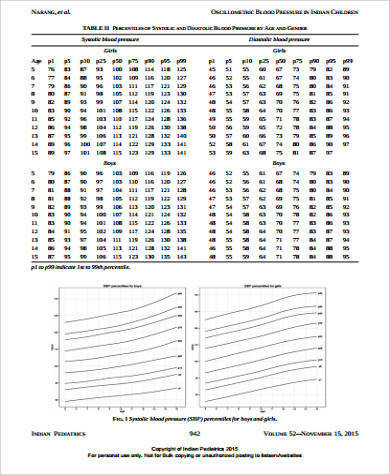 You may also want to check out our BMI Index Chart Samples and Sample Blood Glucose Charts for more charts you can use to track your health. Your blood pressure is affected by many factors. You may notice a few changes in your blood pressure depending on your body’s current state—whether you are resting or doing something. This is because your blood pressure adjusts to meet what your body needs. It is important information that can help with determining your overall health condition. To keep your blood pressure low or maintain a normal blood pressure, adapting a healthy lifestyle is ideal. 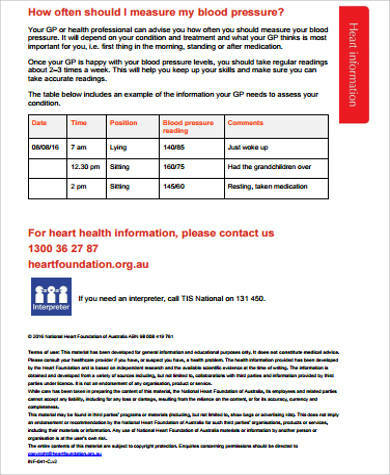 You can make use of the templates to check whether your blood pressure is normal and record it. It will be convenient to have when you go get a check up. It is easy to share and would make it easier for you and your doctor to track what you need to do. 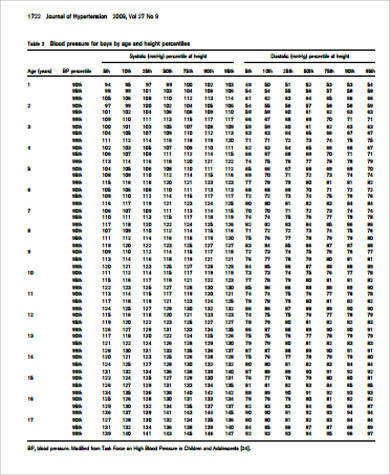 You may also see Chemistry Chart Samples.